Mobile advertising is still being explored in Indonesia. The high level of device’s growth and penetration makes the future of advertising on mobile device look quite promising. This is what Cepatswipe believe, the developer of the lockscreen advertising platform part of Swiperich Pte. Ltd., a digital company which headquarter is in Singapore. Besides having Cepatswipe in Indonesia, they also have Agila Rewards in Philippines. Lockscreen advertising products are now popular on the market, in both local and global market. It requires all parties to possess a unique value, either offers it to consumer or product brand as a business partner. Exploring further information about Cepatswipe and its strategy for Indonesian market, DailySocial discussed with Teguh Kurniawan Harmanda (Manda), Cepatswipe’s Indonesia Head of Business Development. “Although established in Singapore, 80% of the Swiperich team is Indonesian, all our engineers are come from various cities in Indonesia,” Manda said. Cepatswipe team is well aware that the offered advertising model is not the first one or the only one in Indonesia. 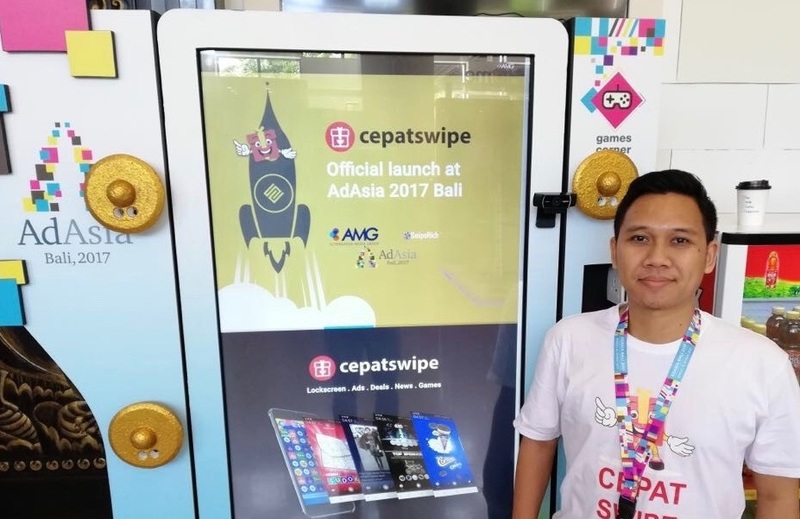 According to Manda, what makes Cepatswipe different with other services is it has partners in Indonesian market, the Alternative Media Group (AMG), which is one of the largest pioneers in Indonesian DOOH (Digital Out of Home). “As business partner, we provide a more specific targeting users by the campaign. Hopefully, there will be more qualified data to be generated to advertiser. In addition, our goal is to bring online marketing to offline store to convert sales,” Manda added. Since the soft launching on May 2017, Cepatswipe claims to have more than 200 thousand users. Manda also told there was hacker who tried to break into Cepatswipe system, which makes the engineer team must strive to maintain excellent service, while strengthen the security system. It cannot be denied, many users are getting tired of smart phone ads. “There is nothing wrong with promos, ads, or other content. It is how to pack it in interesting form and given routine rewards to the users,” Manda said. Cepatswipe wants more than just an ads displayed on user’s lock screen. For a brand, Cepatswipe presents data and analysis with sales trends of its products. The lock screen is not only shows promo or advertisement, but also polls for users as consideration for brand to make decision and marketing strategy. “While Android users unlock their phone, the attention will be on a fullscreen ads displayed. That way the brand gets the full attention,” Manda explained the effectiveness of ads on the lock screen. At the Product Development Conference event held in Jakarta, Swiperich met Pedals. The meeting continued on an intensive discussion that led to Pedals’ investment on Swiperich. There is no detailed information about the value. After the funding, Cepatswipe conducted a grand launching at the International AdAsia 2017 event in Bali on November 8th, 2017. “Through the funding, we plan to get more aggressive in marketing and product development to be the most-favorite advertising and a brand’s goal for campaign by Cepatswipe application,” Manda said.